→8 Ways to Make Money with Wealthy Affiliate – Plus Pro Tips! 8 Ways to Make Money with Wealthy Affiliate – Plus Pro Tips! Thinking about joining Wealthy Affiliate? Or maybe you’ve already joined and are wondering in what ways you will be able to make money with it? Wondering is it even possible to make money? Of course the purpose of becoming a member of Wealthy Affiliate is to make money in the first place, so this is definitely something you should probably know early on or before hand. I’ve been a member since late 2015 so I know my way around pretty well. 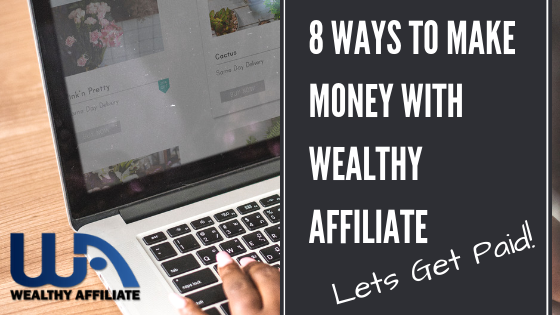 In this post I’ll be going over 8 different ways to earn with Wealthy Affiliate. That’s right…8! It’s pretty obvious that affiliate marketing is going to be one of them, after all, the name of this place is Wealthy “Affiliate”… However, there are a handful of other ways as well, some of which you are probably aware of but others you may not think of. It’s important to know that there are two main ways that you will be able to make money… Earning money from the WA platform itself and earning money from outside sources. What I mean here is that you will be able to actually get paid from WA, as in money deposited into your PayPal account, as well as being able to get paid from various other places in a variety of other ways. So first I will be going over the ways to earn “with” Wealthy Affiliate not “on” Wealthy Affiliate, meaning the different ways you will be able to earn money after going through the training and building your online business. Then after this I will discuss the different ways you can actually earn money “on” the platform itself. All of the ways to earn in this section come from building an online business foundation, which is what you learn at WA. You first must have your website in place and you must be getting traffic in order to monetize it in any of these ways. This is what you are taught to do, mainly via SEO and keyword research. In the next section you will see that there is a way to actually start earning a little bit of money without this requirement of first having your online business in place (aka website). First up is earning with affiliate marketing through affiliate programs. Affiliate programs are promotional programs set up by companies in which they pay people commissions to promote their products and help make sales. How it works is simple: you promote a product via affiliate links and you get paid a commission when you help make a sale. Example: If you were to create a blog about dog training you could join the PetSmart affiliate program and promote a variety of different dog toys, treats, etc. Or of course you could always join the Amazon affiliate program and promote products in just about any niche imaginable. There are lots of different affiliate programs out there, some very high-paying and some not so much. As a rule of thumb, it is always a good idea to diversify your earnings. Don’t just promote one single product from one single affiliate program. Promote various products from various affiliate programs so that your eggs are not all in one basket. Low Cost – To get started doing this you need little to no money. In fact, if you get started on a platform like WA it is free. You don’t need any money to get started because they provide you with a free website and some free training to get going. But of course you will need to spend a bit of money at some point, which still is not much however. Fairly Simple – The simplicity of affiliate marketing is also a big plus. All you do in this business model is promote other people’s products online. There is not much to it really. One you have traffic coming into your website another great opportunity to monetize it is with ads. Usually people start out with the popular Google AdSense, but there also better higher-paying options like Mediavine and Monumetric available once you have enough traffic. Google AdSense is the popular want to start out with because it is easy to get approved for. You don’t need much traffic. With Adsense all you will have to do is insert a code into your site and the ads will be displayed automatically. Other ad services install the codes for you but it is easy to do yourself, so don’t worry. People often think of ads as a distraction. Affiliate marketing is usually where the big money is made, so they don’t want to distract people from clicking on affiliate links with random ads being displayed. However, as long as your site isn’t overly saturated with ads I would say that it is definitely beneficial for making as much money as possible. The fact of the matter is that not everyone who comes to your website is going to click on affiliate links and purchase the product you’re promoting. Maybe they go read an article you wrote and the end up becoming disinterested or something (it happens). Ads are a great way to monetize these people because they present them with different things that are of interest. If you are a good writer and good at incorporating relevant affiliate products into your blogs then I don’t think ads are really going to take away from that. They will simply allow you to earn money from the people who were not going to click on your affiliate links in the first place. Then of course there are CPA offers, a.k.a. Cost Per Action offers. These little guys might not earn you the big bucks, but can still be very lucrative opportunities. Small money adds up and CPA offers definitely should not be overlooked. CPA offers pay you when you get people to do things like..
…and more. They are often easier to monetize because a lot of them are free for people to do, but they don’t pay as much as affiliate marketing opportunities. Once you have traffic coming from the site you created with Wealthy Affiliate you should consider CPA offers. Sometimes they convert better than regular old affiliate offers. This is much less focused on at WA but you can still find training on it. So if you are looking to sell your own products or maybe do some dropshipping, this can be done. The websites you create on the WA platform are run by WordPress so you would have to install a plugin like Woocommerce, which there are tutorials on. This will allow you to sell products directly, process payments, etc. Most people who join WA probably have no products to sell and are more interested in affiliate marketing, but I do get quite a few questions from people asking if they can sell their own products, which of course the answer to is Yes. You can definitely make good money via ecommerce but the downside to it, compared to affiliate marketing, is that it is more complicated. With ecommcerce you have to deal with customers, processing payments, etc. WA also has an affiliate program that you can make money with if you are interested in promoting WA to other people. Some people join this program right from the start but I would suggest going this route after you have already promoted other things… the reason being because if you promote it from the start you really don’t know what you are promoting. You will be promoting a way to make good money online without any proof that it works. But anyways… their affiliate program can be very lucrative so I can see why so many people are attracted to it. You can earn recurring commissions since members pay for their memberships on a monthly or yearly basis (if they upgrade to Premium of course). This affiliate program isn’t the only one out there with recurring payments but it is a darn good one. You only usually find these sorts of recurring payments with subscription services. Inside the WA platform you can also earn what are called Cash and Affiliate Credits. These don’t come from people joining WA for the first time or anything like that. They come from actions that members take inside the platform once they are already members. These credits can be redeemed for real cash deposited to PayPal or can be used to do other things on the platform, like to pay for comments, buy domains, get feedback on your site, etc. Wealthy Affiliate is basically creating an entire little micro-economy around this credit system. They aren’t just some stupid point system for fun. They do make things a little more fun but they also have some real value to them, obviously because they can be cashed out for real cash. Each credit you earn is worth $0.50, so 2 credits = $1. Member created training is a big deal at WA and makes up much of the training provided on the platform. They have the core training created by Kyle (the owner of WA) and Jay (does live video training sessions weekly), but members can also create their own training. This is a great thing because there are many members on WA that are experts in their own way and can provide detailed training on anything they want that has to do with online marketing type stuff… which could be about anything from Pinterest Marketing to effective ad placement and traffic generation techniques. Of course WA recognizes how important the member-created training is and because of this they reward you with cash credits when you create training. You will be able to add video tutorials, screenshots, different steps of the training on different pages, etc. There is a lot you can do to make a very thorough and well laid out tutorial or whatever type of training you are looking to create. The amount of cash credits you will earn depends on the amount of visits, likes, and engagement that your training gets. This gives incentive to actually create good training. WA is also a domain registrar, as is the popular site GoDaddy. What this means is that you can buy domains (websites) directly through WA. This is nice and lots of people do it because it just makes things easier. The cash credits come in when other people that you have referred to WA purchase domains. When a referral of yours buys or renews a domain at WA you earn 2 cash credits, or $1. There really isn’t much you can do here to actually try to earn money this way. You just need to refer members in and many of them will end up purchasing domains through the platform. So obviously the WA affiliate program and this way of earning go hand in hand. This is another way that you can earn credits but you will have to participate in the WA affiliate program and refer in new members as well. When you refer in members they will be prompted to set up their account by adding a profile image and writing a description. When they do this you will earn $1 in Affiliate Credits, which is also 2 credits. Not everyone you refer in is going to take action and do this but you can also message them inside the platform and give them a nudge. Not only can you make money when referrals set up their accounts like this, but it also helps them out as well. When they set up their profile they are more likely to interact and have interactions with others, which adds to the experience and increases chances of success. In the future there are likely going to be other ways to earn as well within the credit system. I already went over this but I think it’s important to touch upon it again just so that you really know what’s going on here. So you might be wondering… what is the best way to earn? There are all these different paths to take, but what should you be focusing on? Well… I’ve been a member for over 3 years and I’ll give you some info on how I’m earning as well as advice to new members. And by the way, I make a living doing this stuff. Affiliate Marketing is #1 for Me – I earn most of my money, by far, from affiliate marketing. I do promote WA and I also have websites in other niches where I promote other things (such as health products). I earn over $6k a month and over 85% of that comes from affiliate marketing. Next Comes Ads – Ads always provide some pretty consistent earnings as long as your website traffic is fairly consistent. And CPA Offers Are Right Up There – There are times where I make quite good money with CPA offers. They are right up there with ads as far as my income goes. My suggestion to new members is to focus mainly on affiliate marketing and ads. The good thing about this is that these are both the main focuses at WA. Affiliate marketing is number 1 and ads are number 2. Not only are they good ways to earn but they are also probably the easiest for beginners to get started with. #1 – Stick to the Training – Try not to get side tracked and waste time on small things like website design annoyances and such. You will learn a lot as you go and you don’t want to spend 10 hours on something that only will take you 2 minutes once you have experience. #2 – Choose a Niche You Actually Like – Don’t focus entirely on the money. Choose a niche that you like when starting a website. If you don’t you will likely get burnt out and quite. I learned this myself… more than once! #3 – Be Patient! – You have to be patient… that is for darn sure. The methods of making money online that WA teaches take a while to get going. That is just the way it is unfortunately… but it can be well worth it. Sign Up at Wealthy Affiliate Now!